- Never before, you see, was there such silence as in that cool night. The dew appeared on the red shields, the helmets looked dull from the dew. The forces of Alexander Peresvet and Andrei Oslabya came up quietly. The monks had brought with them two regiments of their brethren. So it is written in the Mongol chronicles. I can see them now, in their black robes and their birch-bark sandals. They stand, leaning on their huge serrated swords. The novices are reading prayers in a high voice. Candles crackle on the analogions. - You speak as though you really see it all. - I also see how the helmets began to glimmer at daybreak, how the morning wind flapped the prince’s black banner with the golden Saviour, and the cross on top of the wooden staff became rosy. But in the forest there stood hidden the yet untouched, the still fresh cavalry of Prince Vladimir Serpukhovsky and cavalry leader Bobrock. I imagine Prince Serpukhovsky as being old, his bluish-green hair streaming into his leathery face, he is sitting on a bay horse. And Bobrock is probably young, light-haired, with pale eyes, his armored gloves are glittering. I can imagine how he reared to enter the fray, asking the prince to let the cavalry go. Perhaps he even cried with impatience. 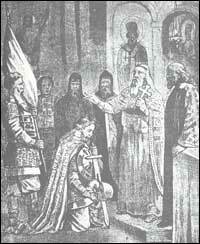 But Prince Vladimir sullenly waited until the Tatars showed their rear. And then the prince struck. The Russian banners on their red wooden staffs streamed past. This was truly a collision of two thundering clouds, and the brilliance of the swords and lances was like lightning. This was when the fate of the Russian land was being decided. And the Russian cloud, glittering with lightning, encircled the Tatar cloud, merged with it, tore it into shreds, swept it away, routed it. The Kulikovo battle became Mamai’s defeat. For many miles the Russians pursued the Tatars. This was our ancient miracle, on September 8, 1380. On the Kulikovo field Russia knocked down the Beast of the Steppes, broke off its horns. When throughout the entire Russian land ran fast streams of blood - ran quite literally, for in Kozelsk, for example, people were wallowing in blood, and when Genghis-khan and Batyi layed down roads of death to the ends of the land, - what could become of devastated Russia? Shining, joyous Russia, with its golden crowns, wonderful feasts, ringing of the bells, boar-hunting and mighty princes was taken unawares by Tatar hordes crossing the Urals, and was stamped out. Lay down completely dead. And this is when it began. I think many people hid in the forests from fear of the Tatars. He, too, went into the thick of the woods. Can you imagine how he, still a youth, alone in the narrow hut endured the forest storms? - Are you talking about Sergius of Radonezh? Young Bartholomew - the future St. Sergius. - Yes, and look, in all the accounts of his life, the bread at first is so rotten that dust comes out of the mouth when you eat it, and the vestments are so moldy that the threads fall apart, the monks refuse to drink the rusty water, and smoky torches are used instead of candles. As though everything is in the vale of death. And then, in the darkness, a quiet light begins to glimmer. Some notice that light emanates from the hands of the venerable one, others see it issuing from the cross and the vestments and the communion chalice, the monks see two holy angels attending Sergius in the altar; and finally, to Sergius himself, in the church of the Holy Trinity, appears the Mother of God, shining with a light brighter than the sun. Early accounts of the life of Sergius are full of stories of such an ascendance of light out of darkness. This is how Russia perceived him. Tormented, frightened, she saw an extraordinary light emanating from the depth of the forest, and she fell down before it, receiving comfort in her sorrow. - You shall be victorious. It is said precisely so in the life of the saint: he whispered, he breathed. It can be said that from his breath, from his whisper Russia came to be. Fear of the Tatars was swept away on the Kulikovo field. The Beast of the Steppes was mortally wounded. He would continue to attack, but he was no longer feared. for the battle with the Tatars. I am sitting on the rickety balcony of a hotel in the mountains beyond Pegamasus. Underneath there is the terrace of a village cafe, all entwined with vines. A yellow shaft of light falls from the terrace onto the dry grass. At first I was displeased at hearing Russian voices (“Russians again”), then I started to listen involuntarily. There were two voices. It was mostly the older one who spoke, while the younger agreed from time to time: “yes, yes,” or “sure, of course.” The one who spoke had an ardent and eager voice. It is often like that. Something touches the heart, and even the shyest and most awkward person suddenly pours forth an excited stream of words. Below are, perhaps, father and son, or two brothers close in age. I listen to them, and their Russian voices, and that hurried “you see” become extraordinarily dear to me. The night is hot. Overhead in the dark sky one can see the shadows of the mountains. It is hard to breathe because of the dry mountain heat. Faraway lightning sparkles noiselessly, bluish in color. There is a distant storm in the mountains. Thunder rolls in the dark sky, with low inaudible claps. 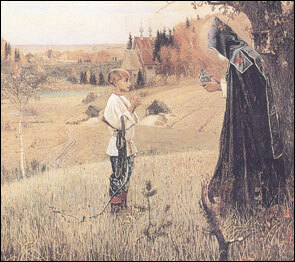 But just then, in the forests near the city of Arzamas, in the little-known Sarov hermitage, there appeared a monk named Seraphim, born Prokhor Moshnin, son of a merchant from Kursk. There is a strange similarity between Sergius of Radonezh and Seraphim of Sarov. Seraphim, like Sergius, was for a long time called woodworker in the monastery. Seraphim, too, had a tame bear. From Seraphim, too, there emanated a quiet light. And to his cell, too, in a column of light, came the Lady Theotokos with Her heavenly entourage. Only the light of Sergius began glimmering in the very darkness, in the vale of death, when the bread was moldy, and the water rusty, and the monastic garments disintegrated. Sergius was like the light of morning in the dead of night. While Seraphim appears as the light of the evening, the last gleam. It happens, you see, when the sun has already gone down, and there is twilight in the evening air, and one distant wall is still warmly lit up… It was as though Saint Seraphim gathered within himself the last light of Holy Russia. And if you notice, he always wore white, a long canvas shirt, a white monastic kamelaukion. He shone. Twilight had already deepened, the cold of night was settling down, and still he shone in the Sarov hermitage with a distant white light. And it is strange that neither Pushkin, nor Gogol ever saw Saint Seraphim, perhaps never even heard of him, and never mention his name. They passed by him, without touching him. And yet they walked side-by-side. At that time only simple God-fearing village women, the neighboring peasants, a few landowners and the nuns of Diveevo knew that in the Sarov hermitage, in the very thick of the forest, the righteous elder Seraphim was standing on a white rock and praying. A thousand days and a thousand nights he stood on the rock. He knew everything and saw everything. He saw the end of Russia, for a thousand days and nights he prayed for her, and when he came down from the rock, he said that such a time will come to Russia, when angels will not have enough time to take up human souls. And such a time has come. What horrible slavery has been imposed, much worse than the Tatars’! What a terrible night. Seraphim of Sarov - the last gleam of light in the night sky. 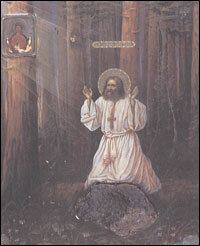 St. Seraphim prays on a rock. But why was there such fullness of joy in the Sarov elder, and why did he always greet everyone: “My joy, welcome, my joy”? I think because he saw everything. And he alone left us the promise that after our times, when the angels become tired of taking up martyred human souls, there will be such a time of joy, of resurrection, when Russia will sing “Christ is risen” in summertime. It was at this that he was overjoyed. He alone knew that there would be a miracle, and he knew how Russia should attain this miracle. He always taught only one thing: the acquisition of the Holy Spirit. The acquisition of the Spirit. Herein lies the meaning of all that is happening in Russia, and why we, immigrant brethren, are sticking around here. To give up or not give up the spirit of God, to betray or not to betray humanity within oneself and others, betray the Son of man. Everything in the world is now stewing around this question. Some have betrayed. Others have not. Do you not feel how millions of people in Russia secretly remain standing in the true spirit and have not betrayed the Holy Spirit, but have acquired It? - And why have we come here? Here we are, you and I, poorer than church mice, former students, former artillerymen, - and who are we now? We left because we could not and did not want to give up our conscience, betray humanity in ourselves and others. We left for the sake of the Holy Spirit. And we will not give up the spirit. You see, everyone must understand that God is to be found in the power of the Spirit. All of us must live and act in the power of the spirit. Only from a new Christian inspiration will a new Russia emerge. There is only one path to the promised miracle of Seraphim: and that is the acquisition of the spirit. I walk down the creaking steps, in order to find out who they are, to sit down with them and listen to them - listen for a long time. Lightning illuminates the white wall and the steps. The low thunderclaps in the mountains have become heavier, more audible. On the terrace a black-eyed servant girl with a thin pale face is putting away the green chairs. I notice two cups on the table, coffee left in one of them. - Have they left? - I ask the servant girl. - Yes. It seems they were Russian, too. I went down into the garden. The dry grass rustles in the warm wind. Their footsteps can no longer be heard. Two voices - perhaps I had imagined them? I stood in the darkness. Large raindrops fell on my hand and face, and they seemed hot to me. Those two Russian voices disappeared into the very storm.